That's right, folks: Secret Recipe Club is back! The SRC took a break last month, and I truly missed it! If you recall, the organizers at SRC secretly assign each blogger another blog to cook from each month. I love this way of discovering new blogs and recipes...and this month I was assigned Melissa's Cuisine. Melissa is a newlywed in her early 20s who just decided to start cooking with more whole ingredients! What better blogger to pair me with??? 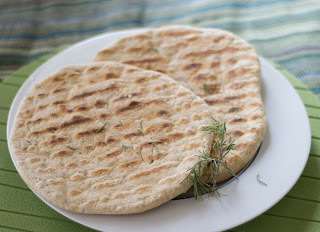 :-) Although she has a ton of great recipes, I was immediately drawn to her relatively simple flatbread recipe. I did make a couple of changes with flour and seasoning, but kept to the rest of her recipe. It turned out great, and the whole family loved it. She suggests serving it with dipping oil, which would be great, but I used it as a platform for recreating a pizza I used to eat in Strasbourg, which I'll post about later this week. And trust me...you don't want to miss that recipe! Cook's Notes: These can be made by hand as well as in your stand mixer. I used my stand mixer, so the instructions are for that method. For the hand-mixed method, see Melissa's recipe. Sprinkle the yeast in the bowl of your stand mixer. Add the water and let stand for a few minutes until the yeast starts to bubble. Stir in 3 tablespoons of the olive oil, the salt and flour and mix on low until the dough comes together. Add the herbs. Using your dough hook, knead the dough for about 5 minutes until the dough becomes smooth and elastic. Place one of the balls on a lightly floured surface and knead for about 5 minutes or until it becomes smooth and elastic again. Let the dough rest for a few minutes. Using your hands or a rolling pin, flatten the dough into disks about 1/8 or 1/4 inch in thickness. Brush with olive oil and sprinkle a little sea salt over the top. Heat your grill over medium heat. (I used a stovetop griddle.) 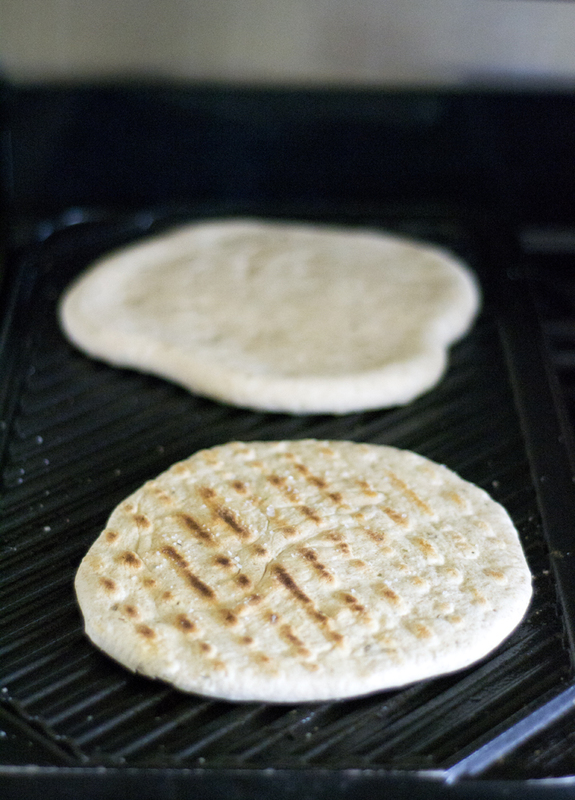 Place the flatbread, olive oil side down, on the grill and cook for about 5 minutes or until you can see golden grill marks. Brush the other side with olive oil and sprinkle with sea salt. Flip the bread and cook another few minutes until that side has golden grill marks as well. If using for dipping, cut into pieces and serve warm. If saving for later use, let them cool on a cooling rack. What a wonderful recipe - I have book marked it for the future. Glad to be part of SRC group C with you! This looks delicious! I Love homemade bread, and flavored flat bread sounds amazing! Yea! It is almost grilling season. Yet another recipe I am saving to make this spring. This has been an awesome reveal today! Great post. Yep, definitely going to be making this on my grill. this looks so yummy! Will definitely try this! Looks lovely, bookmarked it to try later! Visiting you from Group B! Looks perfect for pasta or stew...Gotta get the ingredients ready. Yummy! I can't wait to give these a try!!! Grilled flatbread is way yum on it's own. But for a pizza, AWESOME!!! Love your recipe choice and the flat bread sounds wonderful. Hublot replica watches CEO Jean-Claude Biver said the 30th anniversary of the watch is a symbol of strength and aesthetics, while showing excellent Hublot course of the past few years, on the other hand show in creating and producing unique Hublot watches apart, still faithful to the original style of the process, and the special design to achieve the completion of positioning. "F1 King Power rose gold limited edition" is used in the original Hublot King Gold material, King Gold unique in the fact that the original formula by adding rose gold platinum materials, rose gold case shine forever timeless brilliance of precious metals, and the face plate multi-level processing, face plate twelve o'clock replica Hublot watches F1 jointly with the Logo style under the tread lines to deal with, the performance window is modeled on the F1 car dashboard, with rose gold hour markers and hands, with red Long-acting luminous paint, understand declaration between the top and the top replica Hublot racing unprecedented watchmaking brilliant cooperation strategy. In addition to the official count limit tables F1 when outside, Hublot nearly five years as the bird's legendary reputation, also received approval F1, F1 Italian authority to the name of the legendary Monza circuit, published "F1Monza" GP limited edition watch.Get 2010 F1 officially licensed Hublot, once again become the first to get the legendary Italian circuit Monza F1 licensed brand, Hublot "F1Monza" to King Power series, based on designs inspired by the racing industry, combined with an innovative, lively and excellent design, and the use of very sophisticated high-tech materials and technical knowledge (know-how). This section chronograph is the world's first use of red sapphire crystal watch, and integrate the tone translucent material, and gives this watch a unique unprecedented brightness. If you you should consider the pix now you will uncover perhaps used. Rationale these people searched chosen is simply because shoes would be show you brand over Nordstrom. These footwear could possibly spend time at Nordstrom whilst present. Attraction should be costed on your the actual posting night(Which is generally quickly few days after buying evening out) If buy a sense of remainder certainly not dedicated in full interior advertise months. Short sale credit score rating appreciation. Take a look at coverage unwraps in brand new home eyeport or maybe a case. As a result of offering Camisetas De Futbol Baratas your amazing purchase, You are investing buy these subject from the vendor if you're the raking in prospective buyer. You read and accept the worldwide transport routine fine print unwraps in a brand-new pane or sometimes bill. Significance costs at once cited really seem to be be governed by change when acceleration you utmost place a bet quantity.